Thomas: This is way more than 50 people. Costa: Of course it is; it’s plus one. I tend to dislike the reviews where I feel like I have to write about the qualifiers needed to justify where I am coming from on certain films. 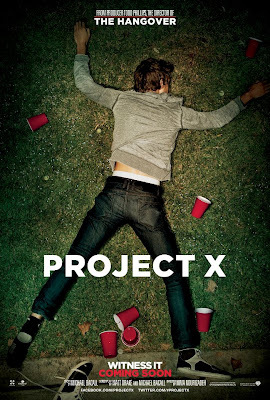 Project X, for example, is a film that is seemingly designed to be enjoyed by the teenage boy crowd, despite being an incredibly hard-R rated film full of debauchery throughout (that description would have saved space for the poster and the MPAA, by the way). I can say I went in open-minded, as, behind the scenes, there are a number of people involved that made this project more intriguing to me. Coming out of it, beyond a few chuckles here and there, there is not really much for me to recommend to the paying movie-going public that couldn’t be found in other, better films or on the internet for other…obvious reasons. Take away the gimmick of making this a ‘found footage’ film and all you have is an unoriginal, tepid, and fairly mean-spirited film that provides plenty in the way of raunchiness, but not much else. Project X takes place in Pasadena, CA, on the day of Thomas Cubb’s birthday. With Thomas’ parents taking off for their anniversary, Thomas’ friends, Costa and J.B., have decided to throw a birthday bash at his place. Costa has recruited a friend of his, Dax, to follow them around and record everything. Despite Thomas’ reluctance, Costa is set on spreading the word as far and wide as possible about the party, hoping that it will make all of them incredibly popular. Spreading the word leads to hopefully getting a lot of the cool, popular, and incredibly hot kids from school (and wherever) to all join in on the festivities. Leading up to the party, the guys manage to score some weed, the promise of plenty of alcohol, and a bounce house (a good time to note that adults should be careful when employing the use of a bounce house for shenanigans; take it from me, I know). The guys even go the extra mile of securing the house, hoping that all the guests (they are hoping for 50 people max) stay outside and alerting the neighbors that there will be a party so they should expect a moderate amount of noise. Cut to later on in the night, much to the surprise of Thomas, Costa, and J.B. the party quickly grows to levels that are out of control. Having just 50 people is the least of their worries, as mild fun quickly turns to utter chaos. Hour by hour, more and more craziness begins to occur, leading to various forms of destruction to Thomas’ house, with Costa attempting to assure him that he’ll be able to take care of everything before the parents come home. As the night goes on, more depravity occurs, despite the fact that these boys are having the time of their lives (throwing ecstasy into the mix certainly changes the tone of things considerably). One could only imagine how things take a turn when the police have to arrive with full riot gear on. In theory, I am all for a movie like this. The decision to shoot this film as a ‘found footage’-type movie was particularly interesting, as it marked the rare time in which that style of filmmaking was applied to a film that was not based around a horror/thriller setting. Seeing a comedic take on the ‘found footage’ style was a neat idea that could have paid off in a number of ways. Similar to what I recently found with Chronicle, taking an idea for a film that could feel fairly generic, I think, actually pays off better in this format by bringing the viewer closer to what these characters are experiencing. It feels more personal in a way, knowing that your lens into what these people are going through is right there in the action with them. Unfortunately, this is not a film that really cares about developing these characters. Our three leads are bland archetypes that I never really liked. Thomas is the de-facto hero of the film, since the main arc of this film revolves around whether or not he becomes well-accepted by his fellow classmates (and of course the girl he has a crush on), but there is nothing really interesting that we learn about him. J.B.’s defining characteristic is that he is the hefty one of the group, ready to use awkward, cheesy tactics to hopefully satisfy his horny urges. And then you have Costa, who I can only imagine is supposed to become the breakout character here, since he is loud and obnoxious, saying anything offensive that he can, in an effort to make an impression, despite the fact that I found him to be nothing but mean and contemptible. Not caring for the three leads (and we know next to nothing about the cameraman, Dax), one has to try and look elsewhere to find some joy. The film manages to have a number of recurring threads that range from somewhat entertaining to wildly unoriginal. Entertaining: the back and forth feud with the neighbor across the street, as well as the use of two underage security guards to try and keep the peace. Not so entertaining: the film’s devotion to having the bland to unlikable to mean lead characters going back and forth between being worried, while the film’s plot also throws in plenty of 80s teen movie clichés. There is fun to be had with this film and I certainly don’t begrudge anyone that does, though I seemed to pretty easily discern what I enjoyed and what I didn’t. This film has been given a lot of credit as being produced by Todd Phillips (director of Old School and The Hangover), which is nice enough, I guess. The more important credits belong to first time director Nima Nourizadeh and writer Michael Bacall. Regardless of how much material was improvised by the actors involved, the story is pretty unoriginal overall, leaving it up to how well everything is put together. Fortunately, there is plenty of energy dispelled throughout this film, as it certainly is not boring, I just wish there was more in the way of real comedy instead of cheap gags and an inherent sleazy nature to the whole experience. Nourizadeh has his roots tied to music videos, which became very apparent watching this film. 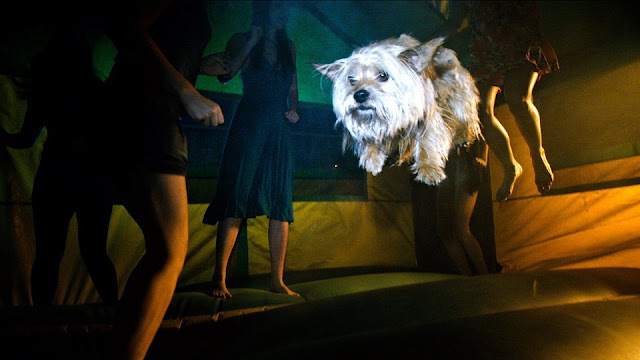 Plenty of stylish (yet crappy looking) shots throughout Project X, much of it in slo-mo, set to hip-hop/dance music all throughout. 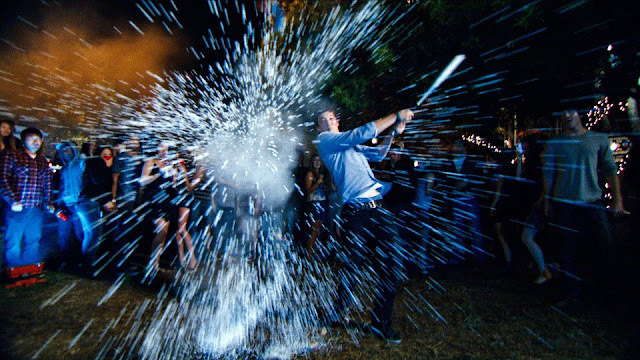 Much like how last week’s Act of Valor is decidedly pro-America (of course), Project X feels decidedly pro-horny teenage dream experience. 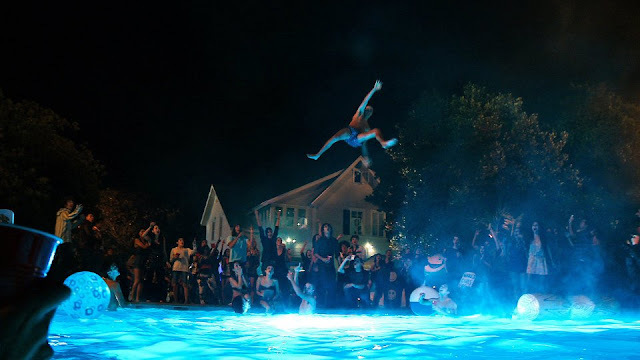 The film openly endorses the idea that supplying a crazy party with alcohol and drugs will definitely make you a god amongst your teenage peers, which is almost fun in an absurd, anarchy-lite kind of way, yet the fact that this film is so shallow makes me hesitate from embracing that notion. The ads for this film put up the quote “Like Superbad on crack”, which I can agree with, essentially because you have taken a good thing and ruined it with a destructive drug. The ultimate party movie is a fun idea, just at least let me be guided by some kids that I don’t find unlikable. Thomas: Is this big enough to be cool?